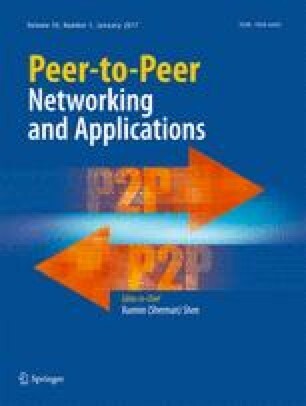 This study suggests to use popularity based caching for IP-based TV (IPTV) services over peer-to-peer (P2P) networks. Each peer in a P2P network can use two levels of cache hierarchy: an internal cache and a neighboring peer cache. Using this property, our main focus is on caching the globally most popular video files nearby the clients, in order to reduce the IPTV service delay, increase the quality of service provided to the clients, and reduce the traffic over the Internet backbone. The proposed framework was applied on real data traces from live P2P networks. The results demonstrate a significant improvement over the Least Recently Used (LRU) and the Least Frequently Used (LFU) cache management schemes. This study is motivated by the vision of large P2P networks consisting of many volunteers serving as peers, each of which has a relatively small cache size, in terms of the number of video items it can store. Since the performance of both the LRU and LFU schemes is very poor for small cache, there is a need for another cache management scheme, which outperforms these schemes, especially for small cache size. The proposed distributed popularity-based caching scheme can significantly increase the performance of P2P networks used for video streaming, with respect to the existing networks, that use the LRU or LFU schemes. The performance metric used for comparison is the cache hit ratio and the expected delay for content delivery. In both parameters a significant improvement is demonstrated.